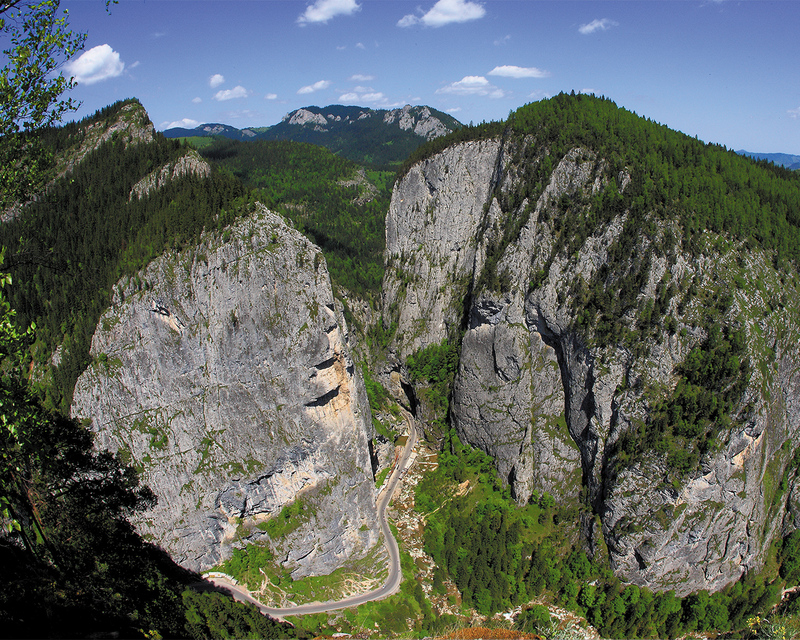 The Bicaz Gorges (Romanian: Cheile Bicazului) is a canyon in Romania, located at 26 km East to the town of Gheorgheni. The canyon was cut by the waters of Bicaz creek. It is a noted location of the wallcreeper, an uncommon cliff-dwelling bird. The road along the 8 kilometres of ravines, often in serpentines with rock on one side and a sheer drop on the other, is one of the most spectacular drives in the country. This natural wonder is one of the country's most important rock climbing area. The Lacul Roşu (Red Lake) - Cheile Bicazului can be considered an rock climbing/mountaineering-paradise. The cliffs are out of solid limestone, therefore receptive to erosion that resulted in the formation of cracks and hollows thus became a perfect rock climbing surface. The rock climbing tradition of the area goes back to the beginning of the last century. Then a group of rock climbers arrived to this region who first climbed the tall tower of the Piatra Altarului. In the next decades the number of the rock climbing routes sprung from 0 to couple of dozen trails that now amount to more than a 100 routes around 150. The area of Lacul Roşu (The Red Lake) - Cheile Bicazului (Bicaz Gorges) served as the scene of several mountaineer races over the decades. This steady growth in the popularity of these cliffs as a rock climbing destination declined toward the end of the century, nowadays however, it is starting to regain its popularity. They want to come back here: 4 Do you want to come back?